This 16 cu. ft. Amana. Upright Freezer comes with Revolutionary Insulation, which helps lower the global warming potential of your freezer by 99.9%19. You can also chill large amounts of food by using the Fast Freeze option, which can cool down the entire freezer. Family sized Epic 7 cu.ft. Manual defrost chest freezer gives you the ability to maximize storage and organization of your favourite frozen foods. This clean white chest freezer features a defrost drain, 1 white coated wire freezer basket, adjustable thermostat and power indicator light. Keep foods ice cold and ultra organized with the Frigidaire Manual Defrost Freezer. Offering up to 14.4 cubic feet of space, plenty of adjustable racks and shelves, and smart security features, this upright freezer is the perfect addition to any home! Keep your frozen food safe and sound with this GE FUF14DLRWW upright freezer, which features a secure door lock and a frost-free design that limits freezer burn. The cabinet shelves and sliding bulk storage drawer provide ample space for organization. Keep your frozen foods easily within reach with this spacious 15.7 cu. ft. GE manual defrost chest freezer. Two big removable baskets are sizable enough to accommodate large quantities of vegetables, meats and frozen treats. Prevent unnecessary access to this GE manual defrost chest freezer with the key lock feature. 15.7 Cu.ft. 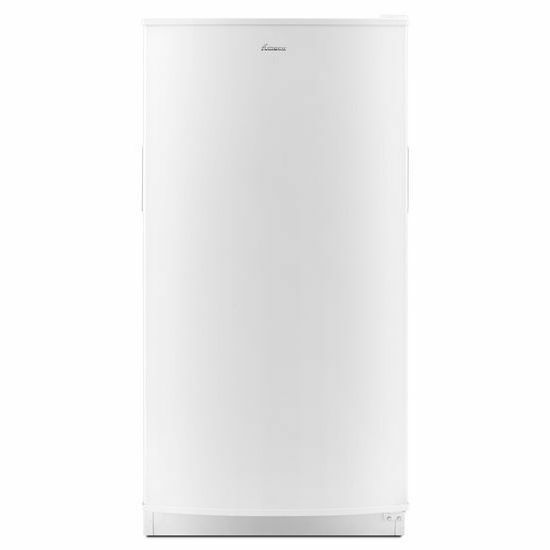 Frost Free Upright Freezer in White This 16 cu. ft. Amana. Upright Freezer comes with Revolutionary Insulation, which helps lower the global warming potential of your freezer by 99.9%19. You can also chill large amounts of food by using the Fast Freeze option, which can cool down the entire freezer. 15.7 Cu.ft. Frost Free Upright Freezer in White is rated 4.7 out of 5 by 129. Rated 5 out of 5 by queenidog from Easy to order, good features I ordered this major appliance on-line, not something I do often but because of road conditions, had to do it this way. Super easy to order, all the info is there including section where you state you want the old freezer removed. This freezer has multiple vertical air vents at the back to evenly distribute cold air. Freezer works perfectly, I like the temperature control panel just inside the door. Very quiet operation. Turned it on and it went to -10C in a couple hours. Rated 4 out of 5 by cordy from Delivery of my order was good. Had it for only one week. So far so good. Have used double door re... Delivery of my order was good. Had it for only one week. So far so good. Have used double door refrigerator by Amana and it has been working very well without any problems. I think they make good products. Rated 5 out of 5 by HWaz from ordered this freezer for business purposes as I'm a food broker to store frozen samples. So far n... ordered this freezer for business purposes as I'm a food broker to store frozen samples. So far no issues, doesn't take a lot of space and works fantastically. Could use another shelf besides the two it came with but not a big deal.